Good morning Doodlebug fans! Nicole here to talk about using your basics. We all have those items in our stash that are great staples, but often get overlooked with all the fun patterned paper out there. I created this page using some of those great basics and you can too! I used a combination of patterned papers in a few of the 6x6 petite prints paper pads to fill in my large diecut title and alternate up and down my page in various color blocking. 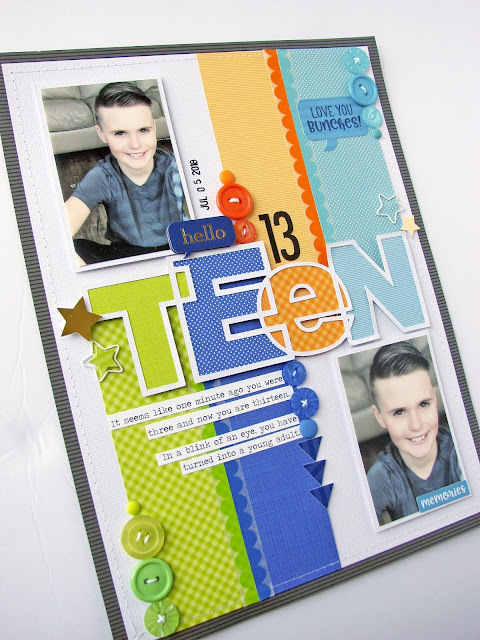 It wasn't too hard to choose which colors to use as the double sided paper pads have so much variety in them! I used a mixture of grid and polka dot patterns for my page. 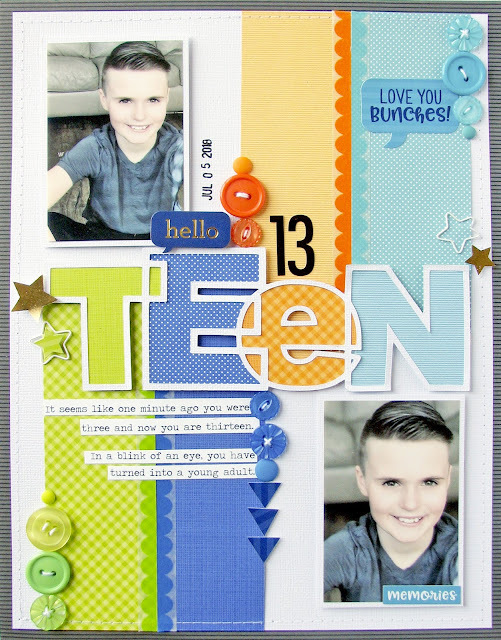 I just love the Boutique Buttons, so I grabbed the ones that co-ordinated with the papers that I chose and added some repeating rows along each color block in Limeade, Denim, Tangerine and Swimming Pool and mixed in some Matte Sprinkles from the Birthday Boy and Zoo collections too. It is really easy to pull together a page using just the basics and it turn out more than just basic! I hope you are inspired to break out some of your own Doodlebug basics and get to work too! Such a fabulous page, love how you did the title! WOW! This page stopped me in my tracks. What an eye catching title--LOVE it! Pumpkin Party | Giveaway Winner! Introducing ... Pumpkin Party and GIVEAWAY!